We don’t know who to give credit to. To Sonam Kapoor for carrying whatever she wears so gracefully? Or to Rhea Kapoor for styling Sonam Kapoor so gracefully? Or is it the designer who saw the vision first? It is only right to give each of them their due. Just when you thought the fiercely feminine blouse is the only interesting detail we are pointing out at, we shall take a moment to say, we do love the power of the off-the-shoulder puff! The flattering and playful puffs make an astounding fashion contender but no, not only that. The queen of quirky prints has done it again, adding fun elements to her bold masterstrokes… Bringing additional drama to the traditional sari is House Of Masaba’s script fabric. ‘Ek Ladki Ko Dekha Toh Aisa Laga’, the pattern reads. 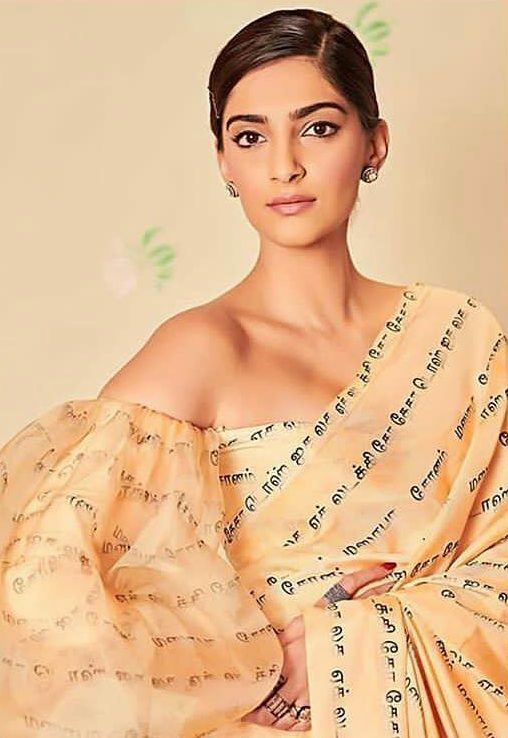 Breaking all stereotypes with her forthcoming film with the same name, Sonam Kapoor is playing a closeted lesbian and promises to set love free! The ‘sorry not sorry’ girl, Sonam completely understands the importance of breaking stereotypes so much so she is also breaking the shackles of fashion. Rhea Kapoor calls the colour of the sari ‘chai wala pani‘. Whatever we may call it, it is a stand-out colour! The dewy makeup, the hair tied in a sleek low bun, the no accessory but the look elevating studs, this guise deserves all the honorary fashion words in the vernacular! Masaba Gupta credits her mother, actress Neena Gupta’s sense of saris for the way it is an intrinsic part of her. About her cricket legend father Vivian Richards, she says, he has a great sense for colour. He is very good at matching colours without looking garish.